Significant foundations were laid earlier by the likes of Napalm Death and Repulsion, but grindcore never quite saw Pig Destroyer coming. This was in 1997 when vocalist J.R. Hayes and Agoraphobic Nosebleed’s Scott Hull formed the band, which then went onto unleash absolute mayhem with albums like Prowler in the Yard (2001), Terrifyer (2004), and Phantom Limb (2007). What set Pig Destroyer apart? It’s hardly enough to say they were any more extreme than Napalm Death or early Carcass. The speed, lyrical content and unapologetic aggression is what makes grindcore inherently extreme. Pig Destroyer has a presence and their sound pushes you into a corner like a heavyweight boxer, mercilessly pulverising your skull. Fans had to wait five years after Phantom Limb for the band’s next album. 2012’s Book Burner was worth the wait though and the release also featured new drummer Adam Jarvis (Misery Index). This was significant for Pig Destroyer. Jarvis is a monster behind the kit and so much of the band's return to the bare bones of grindcore in Phantom Limb and the prowess in the way it was executed is attributed to his talents. A year later, Adam Jarvis’ cousin John Jarvis joined the band as its first bassist. Things were taking shape for Pig Destroyer in a serious way. But, fans were to be kept anxiously waiting again as Pig Destroyer went quiet after Book Burner - for six years. 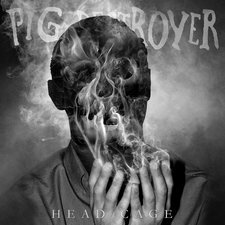 This has made the release of Head Cage arguably one of the most anticipated in 2018. What many might notice first off is that Head Cage is comprised of just 12 tracks. “Book Burner” was 19 tracks for instance and Pig Destroyer has in the past, like many grindcore bands, turned out albums with a bigger number of shorter, more explosive tracks. Head Cage still presents tracks that fit this mould and the album clocks in at around 30 minutes which is actually not too dissimilar from their previous albums. It’s the inclusion of a few longer tracks which, holistically, packages the new album somewhat differently. Overall, I think Pig Destroyer has stuck closely to their roots but, instead of a mean back-alley street dog kicking the other dogs’ asses for their food, on Head Cage the same dog has been fed a solid meal at the backdoor of a deli kitchen. For me, Pig Destroyer hasn’t released anything subpar and this still applies to date. I would imagine there will be some backlash from certain fans for the band mixing things up a bit on Head Cage, but it’s a very good album. This is still Pig Destroyer at its devastating and unsettling best, delivering a brilliantly executed collection of songs. This album is going onto my list of top releases for 2018.